Rifton HTS hygiene toileting system – large accommodates several activities – toileting, showering, bathing – the HTS eliminates the need to buy separate equipment for each activity. For children, each element of the Rifton HTS provides the best opportunity for proper toileting. 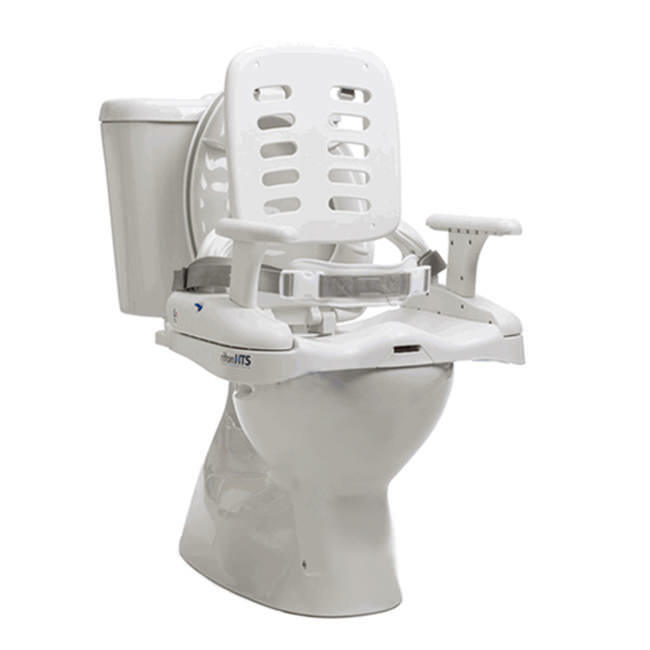 For caregivers, it can be used on, over or off a standard or elongated toilet (even the latest models); it can adjust to children as they grow; it includes accessories and supports for children of every size and need. 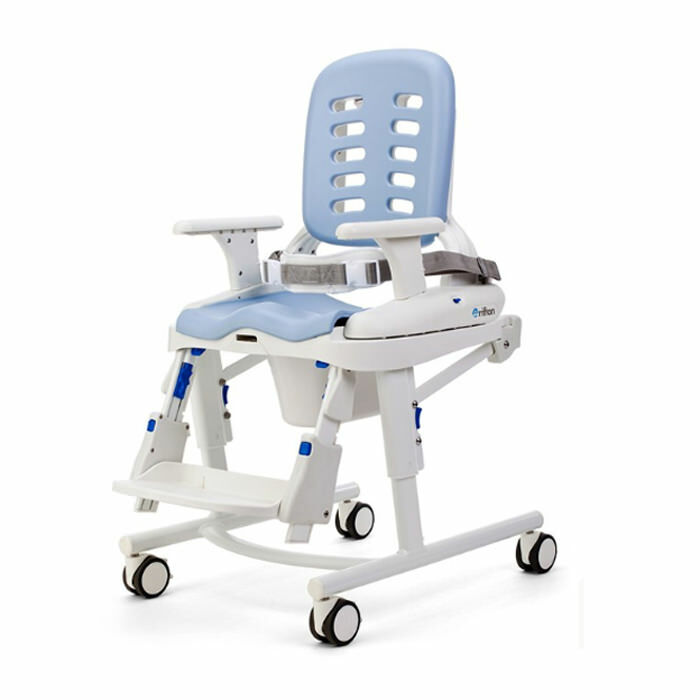 Rifton HTS includes seat and back, seatbelt, a base or mounting bar, and armrests. Adjust the height - One frame accommodates both small and medium seats to allow for children’s growth. Height adjusts from 15" to 21?". The large seat requires a separate frame. Adjust the seat depth - Seat depth adjusts 3"– 4" to fi t the child. Overall depth ranges from 8" on the small Rifton HTS to 18" on the large model. Adjust the backrest - The backrest can be adjusted 6? forward (for proper toileting position), 6? back and 18? back (to assist with showering and hair washing). 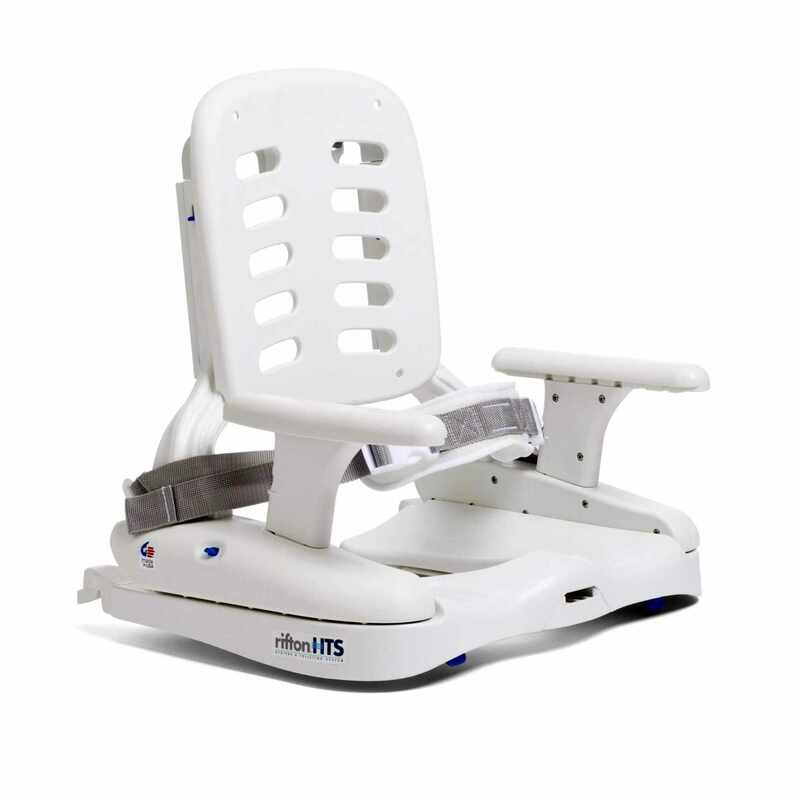 Easy lifts and transfers - The Rifton HTS makes them easier with features like a gas-assisted spring tilt adjustment for sit-to-stand transfers, removable armrests for lateral transfers and a weight-bearing footboard (up to 150 lbs.) for front-loading transfers. Durable-Stainless steel and aluminum, welded and powder-coated frames. 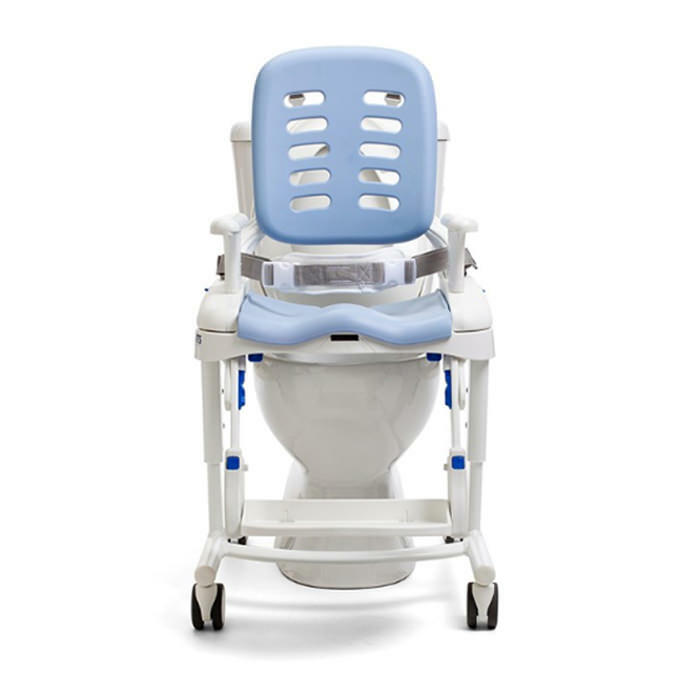 Foam molded cushions-Optional skin foam pads for back and seat provide comfort for children and easy disinfecting for caregivers. 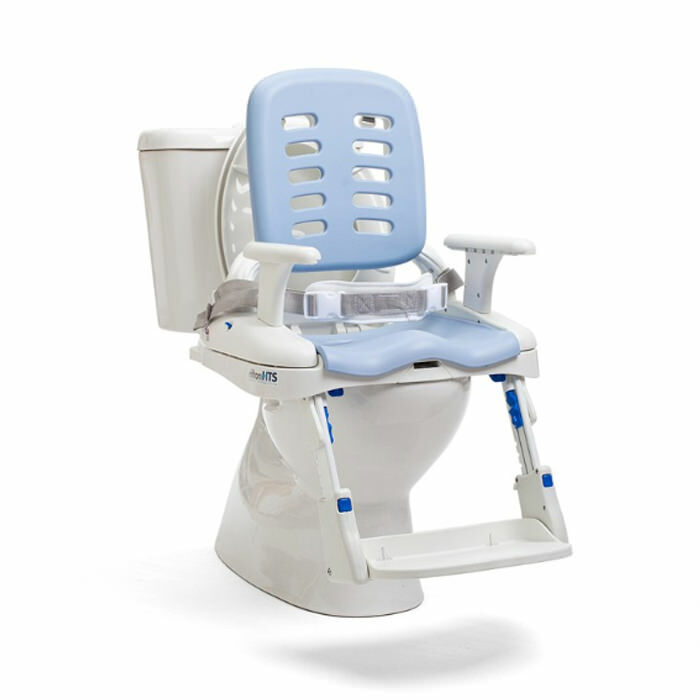 Hygienic design - The unique design of the seat pad opening – open to the rear – facilitates easy access for cleaning and hygiene while clients are still seated and relaxed. Waterproof construction and easy dis-assembly make every element of the Rifton HTS easy to wash and disinfect. Tilt-in-space - With its gas-assisted springs, the Rifton HTS tilts 15? forward for easier transfer, as well as 15? back for showering and hair washing. Protects caregivers - Rifton's new splash guard protects your clothing saving you the inconvenience and time of cleaning up. Seat (front) to footboard height 13" - 18"
Seat (front) to floor; mobile tilt frame 17" - 22.5"
Seat (front) to floor; mobile non-tilt frame 18" - 22"
Seat (front) to floor; stationary non-tilt frame 15" - 19"
Backrest height above seat 24.5"
Maximum clearance height under seat (tilt frame) 20"
Maximum clearance height under seat (stationary non-tilt frame) 16.5"
Maximum clearance height under seat (mobile non-tilt frame) 19.5"
*The maximum working load for the large HTS footboard is 150 lbs.